Cats aren’t that interested in candy, but dogs can eat enough of it – and quickly – to get sick enough to need an ER. Gastrointestinal problems are a typical result, usually vomiting and diarrhea, but if enough chocolate is in the mix or something contains xylitol, you could have some scary issues. 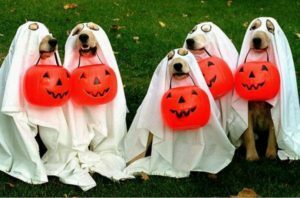 Remind your children not to give any candy to the dog, even though it’s sweet of them to share their bounty. Emergency rooms see an increase in chocolate toxicity over Halloween. Other Halloween decor, such as fake cobwebs and dangling decorations, could create a choking hazard, so keep your pet safely away from them.